As almost everyone will know by now, West Ham beat Blackpool to make it back to the Premier League whilst Blackpool will have another season in the Championship. The match itself held few surprises. Tactically it was relatively predictable with the majority of the elements cited in the preview playing out, even up to the drifting in at the back post by Ricardo Vaz Te which provide crucial at the end. In terms of analysis of the final the excellent The Seventy Two blog together a comprehensive deconstruction of events and it’s well worth a read. The key notes from the game were clearly the pressing, loose balls, Blackpool’s combination play, and the probing plays West Ham were making with long to medium distances passes to either win aerial duels or expose the space in behind Neal Eardley. Football is a game where balance is critical. Teams must be balanced in various ways and the job of the opposition is largely about throwing your team out of balance in whatever way possible. When games such as this are ‘in balance’ for large periods the game is generally settled by the team who converts the chances that come their way or handle the other critical moments, especially in defence. It is here where Blackpool fell just short. Matthew Phillips in particular will benefit from this experience as he’ll learn to clear his mind under pressure to execute his play with greater precision and quality. The Blackpool defence will add this to their learning as they continue their development in to a side that can defend, and perhaps this, more than the offensive side of things is where the two sides were separated. In his second post match Sky television interview, Sam Allardyce laid his arm across the ‘inappropriate trophy’ that had just been handed over, he looked proud, tired and content all at the same time. However, it wasn’t the trophy that caught the eye, but the whiteboard in the background. Upon it alongside the names of Barry Ferguson and Stephen Dobbie were the words ‘Clean’ and ‘Sheet’. 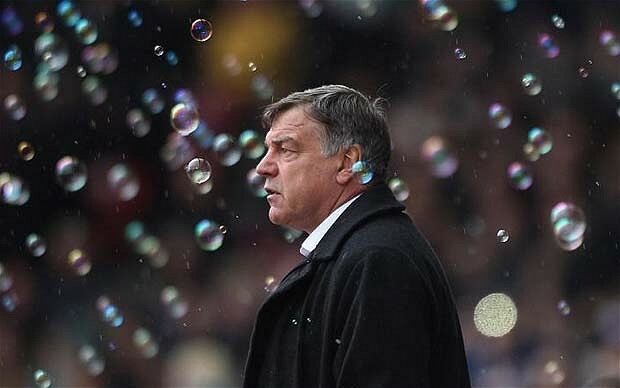 That was and always is a key priority for a man like Allardyce and even though they never achieved it, it can breed defensive discipline. Add this to the fact that the official man of the match was James Tomkins and you get a sense of where these teams have differed over the season. Tomkins has the qualities of a top defender (regardless of Blackpool’s goal), in that allied to his basic skills of heading and tackling, he has that ability at this level to not being exposed to the sort of last-ditch defending that heaps pressure upon teams. Blackpool on the other hand, has defenders who to the basics well, but perhaps don’t have the all round positional awareness at such a consistent level in order to quell teams in burgeoning moments of flight. In addition to this Blackpool missed the injured Gary Taylor-Fletcher as they failed to effectively engage the West Ham centre backs regularly in order to pull them apart or out of position. Kevin Phillips filled in, but despite his 16 goals this season, he appears to enjoy the latter stages of games when they breakdown giving him plenty of space to feast upon. He is superb at finding space, and his shooting is a sight to behold especially when unexpected and released early. However, the central striking role in this Blackpool set up, requires more than a traditional striker. It requires, part midfielder, wide forward and target man too. All too often when West Ham forced Blackpool to go long from back to front, Phillips failed to win the ball. This left Blackpool’s midfield to work hard in order to mop up the loose balls that appeared as a result. Goal kick taken, aerial duel contested, West Ham won, returning the ball high and back in to the Blackpool half. Another aerial duel was contested, Blackpool won, ball returned to the half way line. Upon realising the ball was loose Jack Collinson was first to the ball and hit a first time pass to the left side in the path of Kevin Nolan who had started his run moments earlier. Ian Evatt runs over to cover, but Nolan managed to scuff a cross in to the box. The cross beats the first man, Neal Eardley. Alex Baptiste slips, falls over and the ball breaks towards Stephen Crainey and Carlton Cole. Crainey slips as Carlton Cole uses his strength to reach the ball and poke it to the unmarked Vaz Te. Essentially there were four absolutely critical moments that created the final scuffle that Carlton Cole turned in to a goal. Of those four moments, two were ultimately preventable on Blackpool’s behalf and two combined in to one seamless move by a West Ham player who used his speed of thought, technique, positioning and awareness of movement ahead of him. Eardley could have lunged and cut out the cross, Baptiste may have kept his feet and cleared, arguably Barry Ferguson could have anticipated the break of the ball that Collison seized upon. However, none of this happened, these things also happen for a reason. Yes, they brought back memories of Blackpool’s more calamitous moments in defence over the last few seasons, but as well as being a reminder of the past, it hints at what the future may have held. Blackpool’s Premier League campaign was littered with such defensive issues, and regardless of the recent defensive improvements, it’s in times of pressure where humans tend to revert to their old habits especially if the new ones are not fully ingrained. To see Blackpool at Wembley again was a privilege and to experience the flip side of the outcome might be an important experience for the players and supporters. There’s no shame in losing a football match, most teams lose more than they win, in fact football is probably a game of losses and how they are handled and built upon. This may seem a negative way of viewing things, but nevertheless it’s a way of viewing things. Acceptance goes hand in hand with this and whilst it is a noble approach to try to win every game, it needs to be accepted that more often than not, that won’t happen. Sides such as Stoke survive in the Premier League because they accept the games they are likely to lose and target those that they deem that winning is achievable. This isn’t to say that you give up, far from it, but sometimes you have to pick your battles. Again it’s about balance, going ‘hell for leather’ in trying to win each game can be exhausting. Knowing when to attack and when to defend is a fine art that only the best can master. There are signs that this Blackpool team are gradually getting more balance to their play. The earlier parts of the season saw the team losing their shape all too often making them weak and easy to pick off. It was common to see 6 of 7 players committed to attack leaving them exposed in transitions. Blackpool now attack with 5 or even 4 leaving more space for those players to attack and great security when a turnover occurs. This is perhaps where Blackpool proves such a fascinating case; this side has quietly developed over the course of the season. The second half was stronger than the first and start next season in the same fashion with a smattering of further progress and automatic promotion may not be far off. It’s this prospect that perhaps offers Blackpool a better platform to jump from and in to the Premier League with a keen eye on keeping their status. The last promotion was a momentous feat, but it clearly caught the club cold and exposed their lack of structures, behaviours and strategy amongst other things. There are signs that the club has learnt from this and plans were being mapped out this time around should promotion have been gained i.e. under soil heating. This leads to two aspects. Does the club carry out the potential (current) plans anyway? Or park them for the foreseeable with a view to revisiting them under certain conditions? Due to the way that Blackpool FC is operated, the biggest resource that the club has at its disposal is time. It’s unlikely that financial trouble will cripple the club as it has done and will do to other clubs. Therefore it’s far from unreasonable for the club to plan astutely and communicate plans effectively. The latter is critical as fans appreciation of the here and now is more keenly appreciated as they experience ‘stand still’ whilst other clubs buzz around in pursuit of glory. Obviously the Championship will have a different dynamic next season the six new teams will add their own levels of complexity. Sheffield Wednesday and Charlton will hope to follow the lead set by Norwich and Southampton in recent seasons and earn back to back promotions. Whilst Bolton, Blackburn and Wolves will bring their dishevelled states, dust themselves down and perhaps one or two of them will settle in to something good. Add this to the other good sides in the division and the Championship will be competitive as ever. Blackpool will require a few tweaks to their playing staff in the summer, but nothing too drastic. Keeping talent may be the biggest issues, but as Alan Pardew (after sending his scouts) warned on Sky after the final, Matt Phillips and Tom Ince perhaps need another season at this level. Wise words indeed and ones, if heeded, could grant Blackpool the explosive force needed to dictate games on a regular basis. In terms of recruitment, failures from January (Jamie Murphy and Michael Jacobs) may well be revisited as well as a follow-up on Ian Holloway’s stated admiration for Jacob Butterfield. However, the latter may well be in vain as Premier League teams appear to be waiting to swoop. The final pieces of the jigsaw may well come in the form of trying to secure last season’s successful loan signings such as Stephen Dobbie. Whatever happens this summer, Blackpool must operate with an eye on being ready for pre-season. The last two summers have been borderline shambolic in terms of recruitment planning, albeit last season being better than the previous. This would go someway to keeping the balance and energy flowing at the club and hopefully the lessons from the Oyston money ‘scandal’ will have been learned and never faced again. For Tangerine Dreaming, the future is unclear. A summer break is needed as writing on Championship matches to the level desired is difficult due to the lack of useful metrics and the time needed to draw up meaningful articles. Expect a few close season articles in the next few weeks, read, comment and share as you wish. Thank you ever so much to everyone who has done the very same over the course of this season and since the blog started.